Located in quaint Downtown Mt. Pleasant, 73 & Main is an American restaurant and pub where the food is as good as the bourbon. Inside the restored, historic Mt. 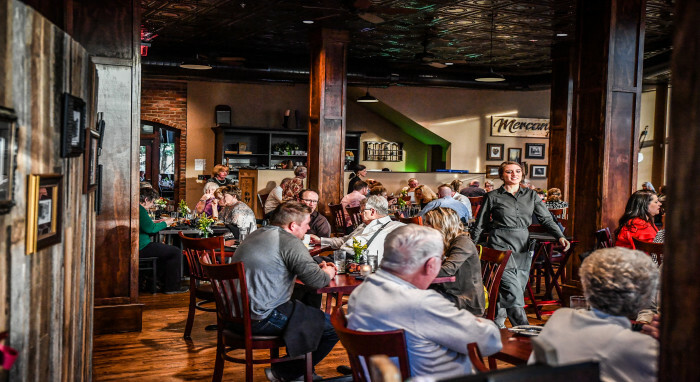 Pleasant Hosiery Mill, guests can opt for an upscale meal in the Mercantile Dining Room or grab a quick bite and local beer on the Hosiery Mill Pub side. Along with homegrown brews, 73 & Main serves up a wide selection of steaks, burgers, seafood and the best bourbon around. With almost 100 different options, the restaurant boasts the largest selection of antique and rare bourbon south of DC. Some menu items even incorporate flavors from nearby Southern Grace Distilleries like the Bone-In Pork Chop finished with Sun Dog Apple Dumpling whiskey sauce. Open for lunch on the weekends and daily for dinner, 73 & Main also offers an impressive spread for brunch on Sundays. Reserve a table and start your day with pastries, southern breakfast favorites, a Bloody Mary that serves as an appetizer, mimosa flights with 11 flavors of house made juices to choose from, and more.